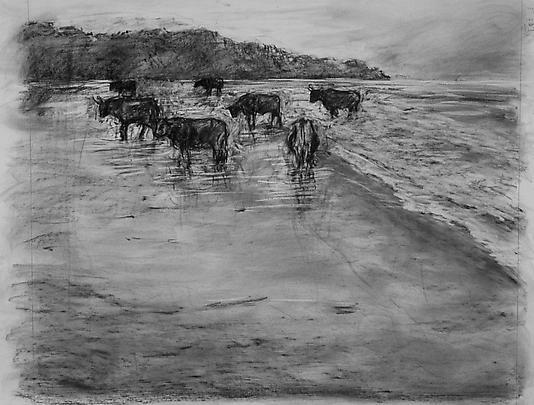 Marian Goodman Gallery is delighted to present the U.S. premiere of two new animated films by the South African artist William Kentridge. The exhibition, which will include new drawings related to each of the films, opens to the public on Thursday, March 4th and will continue through April 10th. Gallery hours are Monday through Saturday, 10 am to 6 pm. 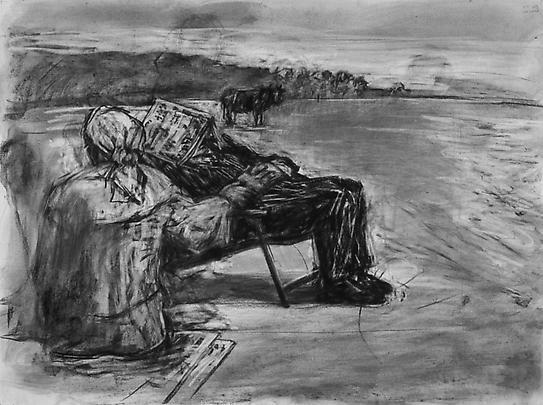 The exhibition will feature William Kentridge's most recent animated film, Tide Table (2003), which will be shown in the North Gallery, along with over thirty drawings related to the film. In Tide Table Kentridge returns to his protagonist Soho Eckstein, the industrialist and real-estate developer prominent in earlier works such as Johannesburg, 2nd Greatest City After Paris (1989), whose last appearance was in Stereoscope (1999) . Learning the Flute (2003) will be also be shown simultaneously, along with a selection of original drawings used in its making. A 35-mm animated film projected onto blackboard and easel with a soundtrack which incorporates the overture to Mozart's The Magic Flute, this film originated as an exercise in preparation for a full-length production of the opera Der Zauberflote, which William Kentridge plans to direct at the Théâtre Royal de la Monnaie in Brussels in 2005. Learning the Flute features a tonal inversion of projected chalk drawings as the basis for its animation. 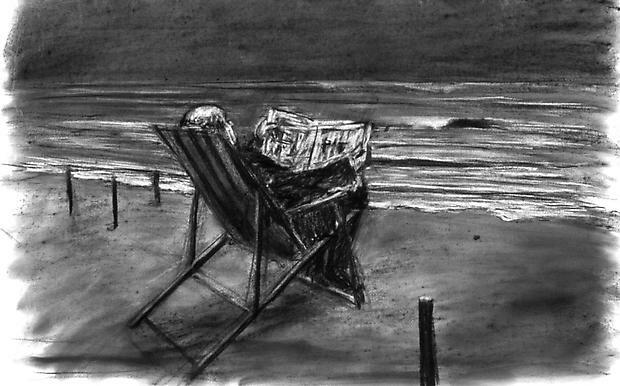 Kentridge writes about the symbolism of this rendering: "The inversion of black & white-the white becoming the black of the blackboard, the charcoal becoming the white chalk-suggested the idea of the negative, particularly the photographic negative. Drawings of Egyptian temples and sculptures when inverted appear as large glass negatives, suggesting the world of 19th-century photography. It also suggested the two realms of 'The Magic Flute': the Queen of Night associated with darkness and the moon; and that of Zarastro, associated with light and the sun. And of course male wisdom, science, knowledge, and all the other ambiguities and contradictions with which the opera abounds… The photographic element of the production propels it out of the 18th century towards the end of the 19th - which in turn suggests particular societies, clubs, or scientific bodies in which to situate Zorastro's priests, and from which to exclude the Queen of the Night and her three acolytes…. The images tested out on the blackboard range from the Egyptian (particularly the falcon but also the sphinx in the cage); to the Napoleonic - slightly after Mozart's time, but referring to Schinkel's great designs for the opera. There is a diagrammatic stage machinery. The 20th century has a look-in through Man Ray's perfect Masonic objects (the eye on the arm of a metronome)." 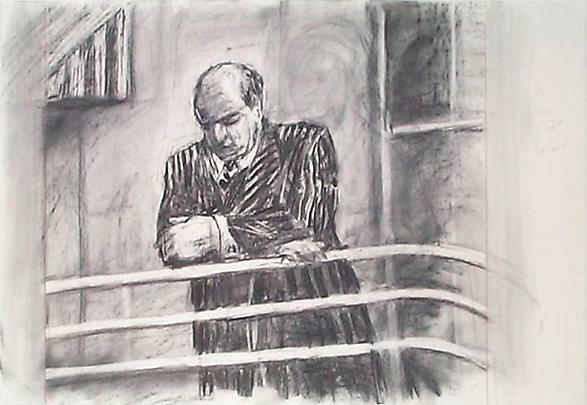 William Kentridge has gained international attention for his distinctive and unique short, animated films, and for his drawings based on erasure, as well as for his longtime commitment to the theater, specifically his collaboration with the Handspring Puppet Company, Johannesburg. In 2003, he was awarded the prestigious Kaisserring Prize, Monchehaus/Museum für Moderne Kunst, Goslar, Germany. This January 2004, a major retrospective survey which expands on his 2001-2002 American tour and includes his most recent work, opened at the Castello di Rivoli Museo d'Arte Contemporanea, Rivoli-Turin, and will tour through the summer of 2005 to venues in four countries: K20/K21 Kunstsammlung Nordrhein-Westfalen, Dusseldorf,; the Museum of Contemporary Art, Sydney; the Musée d'art contemporain de Montreal; and the Johannesburg Art Gallery, Johannesburg. Upcoming solo projects include the U.S. premiere of Il Ritorno d'Ullise (The Return of Ulysses), a multimedia chamber production of the Monteverdi opera, scheduled to open March 2nd, and run March 3rd, 5th, and 6th at the John Jay College Theater, Lincoln Center, New York, as part of Lincoln Center's Great Performers: New Visions Series. This spring, he will have a solo show at the Musée de Valence, Valence, France, which will travel in the late fall to the Musée-Château, Annecy, France. In addition to the Castello di Rivoli retrospective, his work is currently on view in Moving Pictures, at the Guggenheim Museum, Bilbao, Spain; Outlook in Athens, Greece; Drawing Modern: Works from the Agnes Gund Collection at the Cleveland Museum of Art, Cleveland, Ohio; and Synopsis III: Testimonies Between Fiction & Reality, at the National Museum of Contemporary Art, Athens, Greece. Important past one-man shows include a U.S. retrospective survey in 2001-2002 which toured to The Hirshhorn Museum & Sculpture Garden, Washington, D.C., the Museum of Contemporary Art, New York, the MCA, Chicago, LACMA, Los Angeles, and the South African National Gallery, Capetown. Solo projects were also held at The Museum of Modern Art, New York; and the Museum of Contemporary Art, San Diego (which went to seven other venues). 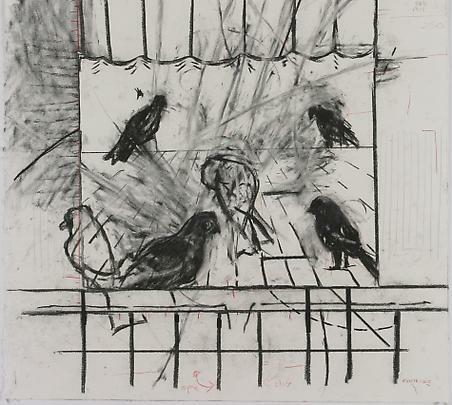 In Europe, a survey of Kentridge's work was shown at the Palais des Beaux Arts, Brussels, travelling to Munich, Graz, Barcelona, London, and Marseilles. Other international venues have included Documenta 11 and 10, Kassel, and the Carnegie International, 1999/2000 for which he won the Carnegie Prize (in 2000). A major new catalogue, William Kentridge (2004, Skira) published on the occasion of the Castello di Rivoli exhibition and including the artist's writings, an anthology of critical writings, and new essays by the curator Carolyn Christov-Bakargiev and South African cultural historian Jane Taylor, will be available during the exhibition.